This gentle but efficient exfoliator works two ways! Salicylic, Lactic and Glycolic Acids encourage clarity and brightness by dissolving skin cell buildup. 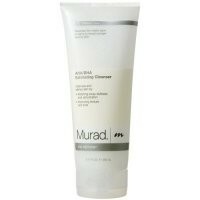 I didn't notice any anti-ageing benefits but this was a very good gentle cleanser that left skin clean and refreshed. The beads are not too harsh on the skin and buffs away dead skin well. As above, has an odd scent to it, but soon leaves the skin after rinsing. Mild and foams up a little. A very mild be very effective product. A light exfoliator which effectively cleans, leaving the skin feel fresh. Good value given that you don't use very much. I thought that this exfoliating cleanser may be a little harsh for my skin but i was wrong. It has a lovely consistancy and the little exfoliating particles are just the right size and not too abrasive. Only a little is needed and when applied to a damp face it lathers slightly and cleanses really well. After rinsing and patting dry my face felt really clean and looked visibly clearer. This product is very expensive and i have used just as good cheaper products but i would recommend this because it is gentle yet effective.